Historically, bone defects have been treated via bone grafting. Bone autografts (taken from patient’s own body) have traditionally been the most common treatment for significant bone defects since 1983. The biggest issue with bone grafting techniques is that they fail to account for any residual deformities, such as soft-tissue deformity, joint contractures, and limb length discrepancies. Dr. Paley now corrects bone defects by a technique called bone transport. Bone transport uses an external fixator to migrate the bone segment, creating new bone in its path. Using an external fixator not only restores the integrity of the bone, but also is effective in eliminating any residual problems during and after treatment. At the Paley Institute we have successfully treated bone defects ranging from 2 cm to 20 cm (one to eight inches). 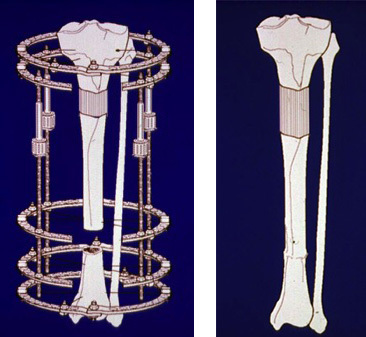 In a bone transport, the length of the leg is maintained and the bone gap is gradually corrected through lengthening with an external fixator. The fixator we typically use is a circular device, the Taylor Spatial Frame (TSF) or the Ilizarov fixator. Dr. Paley will extend the external fixator to adjacent joints in order to minimize contractures and soft-tissue deformities. A segment of bone is cut (osteotomy) and the external fixator migrates that piece of bone slowly towards the defect. 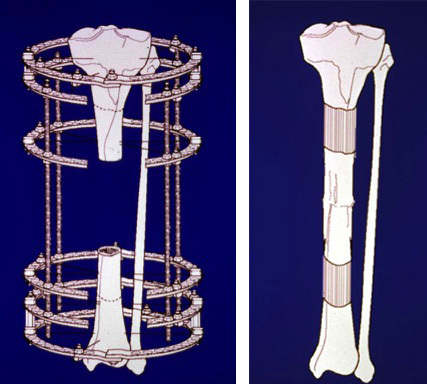 The bone descends through the soft tissues like an elevator. As the bone descends, it creates new bone in its path. When the bone comes together it forms what is called a docking site. At the docking site, Dr. Paley will then perform a bone graft and insert a rod to hold this arrangement in place. The external fixator can then lengthen the bone to equalize any limb length discrepancy. Regenerate bone forms as bone segment descends. Bone ends meet at the docking site. If there is a very large bone defect, bone transport can be performed simultaneously from both directions. In this case, two osteotomies are performed and two bone segments are transported towards each other. 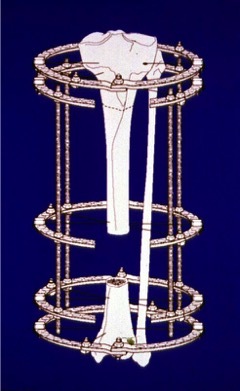 A different ring on the external fixator transports each bone segment. New bone will form in each direction and the two bone segments will meet at the docking site. Once again, a bone graft and an internal rod are used to hold the arrangement in place. Example of double-level bone transport. Both segments advance towards each other and meet at the docking site. An excellent bone result is a union without infection, no residual deformities, no limb length discrepancies, and union wide enough to not require long-term bracing. An excellent functional result was a patient who had no pain, did not require any walking devices, no joint contractures, no significant loss of range-of-motion compared to preoperative levels, and was able to return to normal activities without difficulty. The results of the study indicated good to excellent bone and functional results for all patients, despite having significantly large bone defects. Comparisons to bone grafting procedures also indicated that bone transport was faster, safer, less expensive, and easier to perform. The main disadvantage of bone transport is the lengthy treatment time required by the external fixator and associated hardships on the patient and the patient’s family and primary caregivers. However, since the original injury has already imposed serious hardships on the patient, the benefits of the procedure are well worth the lengthy treatment and associated risks.